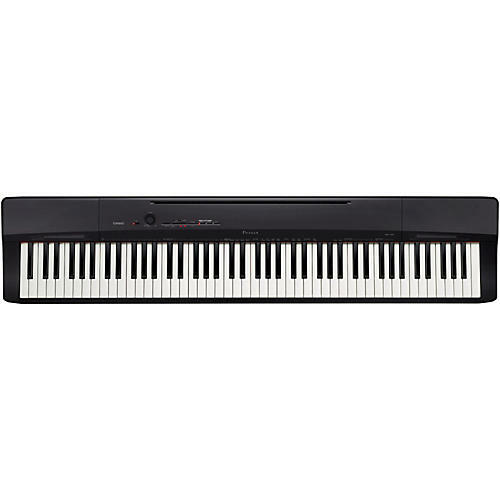 The Privia Series digital pianos have provided a strong option for people seeking an affordable digital piano with authentic sound and action since its introduction in 2003. The PX160GD is part of the latest version of the Privia series, housed in a classic black chassis. It is stylish and handsome, and every bit a Privia. With more than three times the memory of the previous iteration of the Privia series, the AiR processor provides four discrete samples that trigger according to velocity. This means that when you play a forte passage, not only is it louder, it simulates the fire and explosiveness of an acoustic piano played at a louder dynamic. Adjacent strings vibrate, and the character of the attack varies wildly according to playing volume, and the multiple samples triggered by velocity enable the new generation of Privia pianos to emulate an acoustic piano's vast range of expression. AiR even simulates the sound of the open strings when the damper pedal is engaged. Sure, it looks on paper like it should sound great, but there is a vast chasm between the printed circuit board and your ears. That's where the Privia's sound system comes in. First, the sounds are amplified in stereo by two eight-watt power stages. The stereo presentation of the sounds preserves a beautiful stereo imaging created in the original samples, and additionally apply stereo effects like chorus and vibrato for an enchanting listening and playing experience. The speakers are ported to the rear, so when you place your Privia against a wall (which is where it typically will reside), you experience a rich and thrilling enhanced low end. Quality transducers, clean power and a smart port design make a magnificent reproduction system for the latest Privia keyboard samples. Connecting to your computer is fast and easy with Privia via USB. You can use the USB connection to control virtual instruments and other music software applications including sequencing, notation and recording programs. You can offload completed sequences from the built-in two track digital recorder, or bring other songs into the Privia for playback in song mode. Size Dimensions with Optional Keyboard Stand: 52" x 11.5" x 30.2"
One year parts and labor warranty on all keyboards (includes power supply).